Everywhere I go, people have their faces shoved in their phones. As I sit here typing this, my roommate has been on her phone for almost an hour now, scrolling through Snapchat stories. Every semester, I get so excited for new classes and meeting new friends in those classes. I honestly don’t know why I still get excited because for the past five semesters, I have been hit with the same wall of disappointment upon entering the classroom on the first day. Heads down, fingers furiously typing. No ‘Hi, my name is Hannah, can I sit next to you?’ No ‘Hey, I’m wicked excited for this class, what do you think the professor will be like?’ No interaction period. Even when I go home for holidays, my mom and dad sit on the couch on Facebook ignoring my existence. I always say I was born in the wrong era. I wish I could’ve lived in a time where friends met up for lunch and actually spoke to one another and laughed or went on an adventure because they wanted to be carefree and happy, not to take a ‘picture perfect’ photo for Instagram or Snapchat. Social media is teaching our generation and ones to come after us that putting forth the best versions of ourself is more important than being happy. Let us put how much people really use Snapchat into perspective. 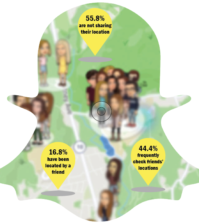 Snapchat users post over 777 million snaps per day, according to oursocialtimes.com. That is 9,000 snaps per second. 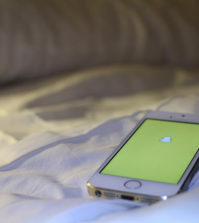 Data released from the same website last April revealed that users of Snapchat were watching 10 billion videos per day. I no longer wanted to be one of millions of Snapchat users, feeding into the same mind-washing routines. One week before school started, I did the unthinkable… I deleted my Snapchat, just to see what would happen. I was tired of feeling like I had to watch everyone’s Snapchat stories to feel fulfilled with my own life. I hated watching other people’s memories instead of making my own. I also hated ruining wonderful moments to stop and snap a photo and upload it to my story just so others knew I was having fun. So I just stopped, cold turkey, and let me tell you, it was not easy. I will admit, the first week was brutal. I had bad withdrawals and I wanted the app back more than anything, but that just fueled the fire inside me. Why should an app be the most important thing in my life? Instead of missing Snapchat and feeling sorry for myself, I busied myself with new friends and new activities. I actually made time in my day to have real face-to-face interaction with people that I care about, and I’ve never been happier or felt more in control of my own life. Instead of worrying when the cute boy from my media law class will Snapchat me back, I am worried about renting a house next year, or what my friends and I are going to do this weekend. You know the saying, ‘Don’t sweat the small stuff’? Well, Snapchat is the small stuff and I am not sweating it anymore. It is now a month later since deleting Snapchat from my phone. It is a weight off my shoulders, one less thing to stress about. I no longer have to keep up with all those stupid Snapchat streaks or watch people’s stories for hours. I can live my own life and that is really refreshing. Don’t get me wrong-social media is great for a lot of reasons, one of them being to catch up on what your friends are doing. I love to post a killer Instagram just as much as the next girl, but when social media starts to negatively impact me and my happiness, that’s when it was time for a change. When people ask for my Snapchat now, I proudly say that I don’t have one and if they want to see me, they can see me in person. …Oh, and by the way, my roommate is still on her phone.